Restrictions and exclusions may apply. Hotel savings vary depending on date of travel. Two-night minimum stay required. Treasure isn’t always buried. Sometimes it’s right out in the open and all around you. 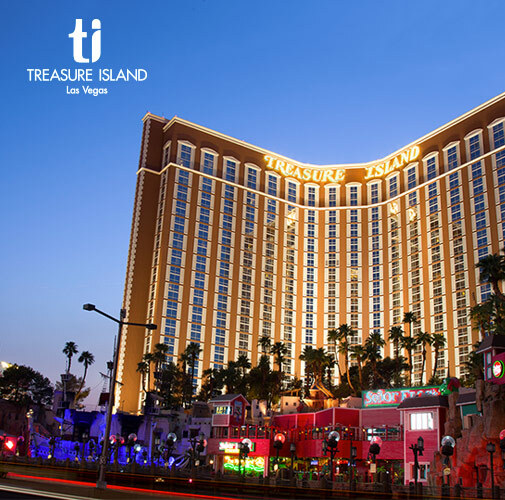 When you stay at Treasure Island Las Vegas, you’ll find it in everything from the shows to the dining. Every single aspect of this exciting getaway is surrounded by adventure, romance, and of course, pure fun. *Added value offer includes savings such as drink and dining discounts at select locations; buy one, get one free admission to Marvel Avengers S.T.A.T.I.O.N Exhibit; a $50 pool cabana credit (valid Monday – Thursday, now through 10/31/19); and free parking. Resort fees collected at hotel. Restrictions and exclusion apply. Reservations may also be required for some of the other offers. Look for redemption details in your travel documents prior to departure. Seats are limited and may not be available on some flights that operate during peak travel times and holiday periods. Flight and hotel rates may vary by day of week. Hotel surcharges may apply to weekends, holidays, and convention periods. Flights available on published scheduled service only. Rates may be subject to change until purchased. Discounts are valid per reservation before taxes are applied. Offer not valid on existing reservations and may not be combined with any other offer. Subject to availability. Restrictions apply. The Mark Travel Corporation is the tour operator for Southwest Vacations.